Special Discount...... With your order of $50 or more, receive a discount of 10%. Enter discount code TA10 to your order. Below is a sampling of some of the handcrafted decorative tropical designs you will find at Tropic Accents. A wonderful selection of painted geckos, butterfly wall hangings, decorative sun designs, frogs, turtles, crabs, tropical fish and many more tropical designs, all handcrafted in Haiti. nnot be combined with any otheTropic Accents offers hand painted metal tropical designs that have been hand cut from recycled steel 55 gallon oil drums. After the drum has been fully cleaned, and flattened, the design is drawn onto the metal and hand cut with hammer and chisel. Using various hand tools, the finishing touches are cut on to the piece to create definition and shape to the tropical piece of art. Then follows the cheerful artwork by our talented artists. Each piece receives a final coat of polyurethane varnish to create a hand painted design for your tropical home decor. Please visit our other websites, featuring handcrafted gifts & home decor. Tropic Accents strives toward producing high quality, hand crafted home decorative items that you will be proud to give as a gift or to display in your home or outdoor garden decorating. All of our painted metal art pieces are hand cut and sculpted from the metal of recycled steel drums in Haiti. The piece is treated with a rust retardant coating prior to the artistic hand painting. To protect the artwork, a polyurethane finish is applied. Cheerful tropical decor for both indoor decoration and outdoor garden art decor. Best if used on covered porch outside of the weather. 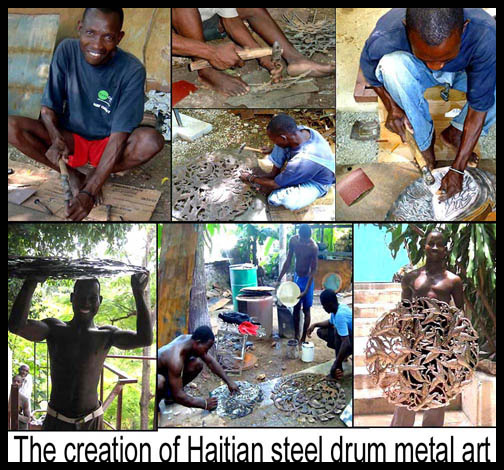 Made in Haiti by our very talented metal sculptors and artists. 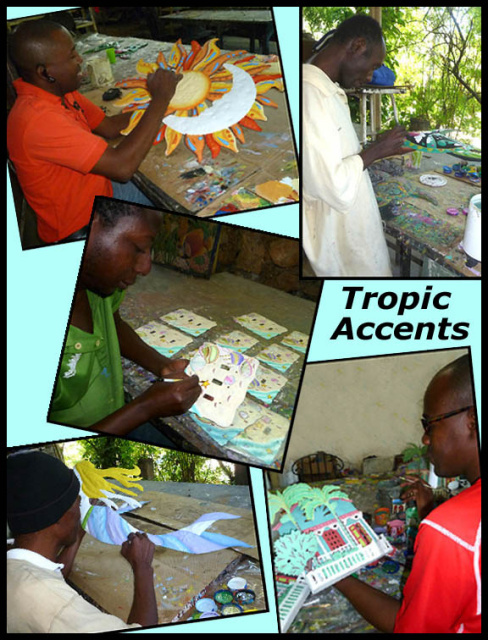 Tropic Accents features handcrafted, colourful Caribbean style wall decor that will bring an exciting vibrancy to your home decor or outdoor decoration. 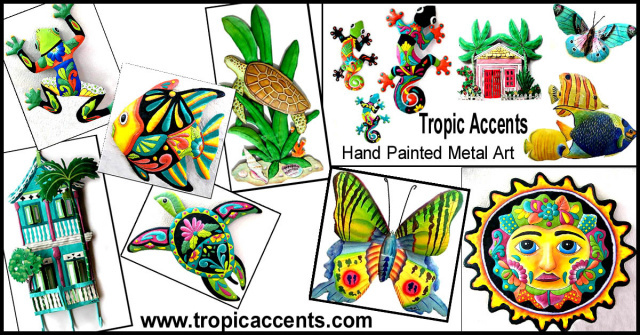 Brighten your patio, pool area, garden, kitchen, bathroom or beach house with hand painted metal tropical design pieces from Tropic Accents, your one stop website for tropical Caribbean style decorating. 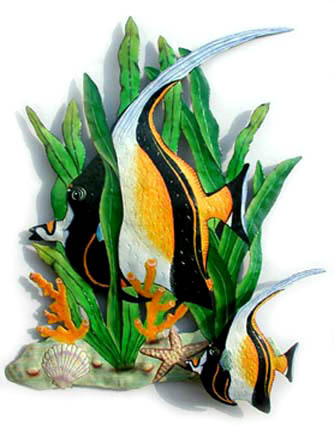 You will find brightly hand painted metal geckos, butterflies, dragonflies, colorful sun wall hangings, Caribbean style houses, tropical fish wall decor and much more. All in all, you can fill your tropical decorative needs here at Tropic Accents. Your credit card information is secure on this website. The designs shown on the Tropic Accents website are protected by copyright.